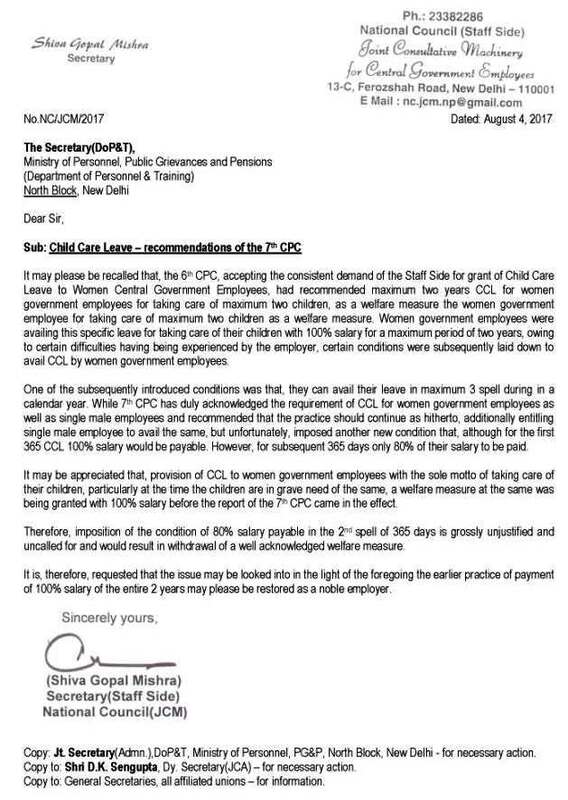 It may please be recalled that, the 6th CPC, accepting the consistent demand of the Staff Side for grant of Child Care Leave to Women Central Government Employees, had recommended maximum two years CCL for women government employees for taking care of maximum two children, as a welfare measure the women government employee for taking care of maximum two children as a welfare measure. Women government employees were availing this specific leave for taking care of their children with 100% salary for a maximum period of two years, owing to certain difficulties having being experienced by the employer, certain conditions were subsequently laid down to avail CCL by women government employees. One of the subsequently introduced conditions was that, they can avail their leave in maximum 3 spell during in a calendar year. While 7th CPC has duly acknowledged the requirement of CCL for women government employees as well as single male employees and recommended that the practice should continue as hitherto, additionally entitling single male employee to avail the same, but unfortunately, imposed another new condition that, although for the first 365 CCL 100% salary would be payable. However, for subsequent 365 days only 80% of their salary to be paid. It may be appreciated that, provision of CCL to women government employees with the sole motto of taking care of their children, particularly at the time the children are in grave need of the same, a welfare measure at the same was being granted with 100% salary before the report of the 7th CPC came in the effect. Therefore, imposition of the condition of 80% salary payable in the 2nd spell of 365 days is grossly unjustified and uncalled for and would result in withdrawal of a well acknowledged welfare measure. It is, therefore, requested that the issue may be looked into in the light of the foregoing the earlier practice of payment of 100% salary of the entire 2 years may please be restored as a noble employer.